Fat Tuesday is just a few days away and I feel the need to get into the spirit early due to a hankering for some shrimp and sausage. I wanted to make a shrimp boil, it's pretty simple as there are only 4 main ingredients to it: shrimp, andouillle sausage, potatoes and corn... on the cob. This is Chicago and we are in the middle of a polar vortex, there are no cobs of corn to be found here. So I had to adjust my plan. I decided to skip the boil portion and just cook the remaining ingredients in ghee and lemon. Ghee is essentially clarified butter, the milk and water solids have been boiled off leaving rich, golden butterfat. 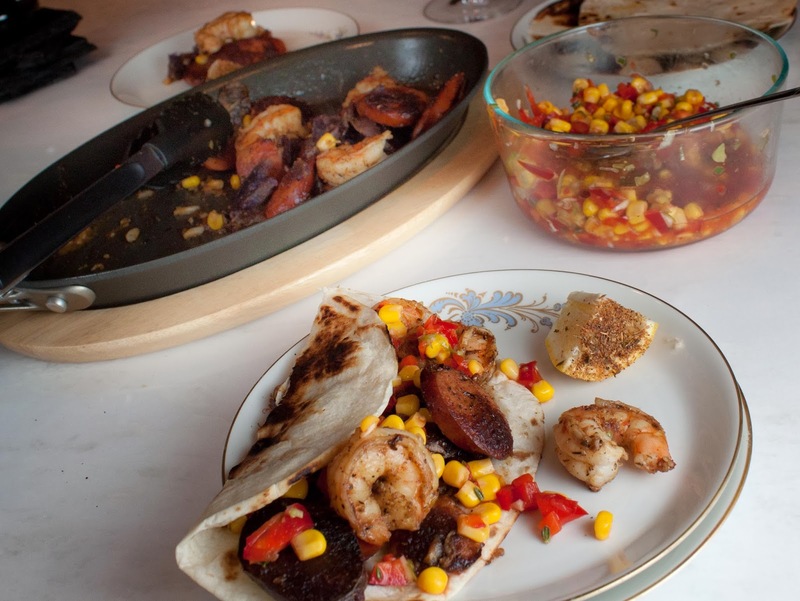 So the shrimp and sausage were covered, but that leaves the corn, what to do with the corn. A simple toss with some red peppers, lemon and tabasco and I ended up with perfect relish topping for my shrimp and sausage saute. Add a tortilla and I essentially ended up with a fajita-like dinner. 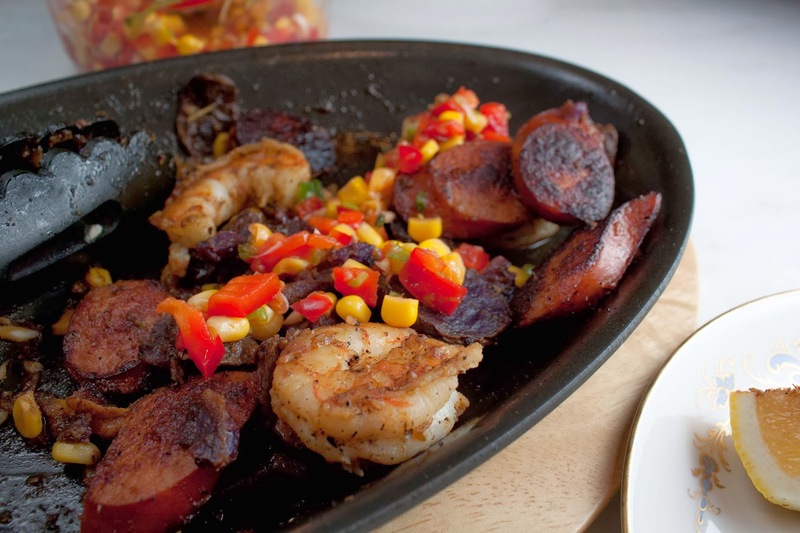 Get out the beads and get your taste buds ready with this Fat and Happy fajita-like Shrimp Boil (sortof). Fat and Happy Tips and Techniques: This recipe made a hearty meal for two with just a couple of leftover bites. Toss corn kernels, diced red pepper, chopped green onions, juice of 1 lemon, 2 minced cloves, thyme and the tabasco sauce in a bowl. Add a pinch of salt and set aside. Can add additional tabasco if you would like more heat. Heat 1 tablespoon of the ghee over medium heat, add in the sliced potatoes in a single layer, if possible, sprinkle with the seafood seasoning. Cook until browned on one side, flip and brown on the second side. Pour onto a plate and set aside. Place the pan back on the heat and add the sausage, sprinkle with the seasoning. Cook until browned on the bottom and then flip and brown on the second side. Push the sausage aside, add the 2nd tablespoon of ghee to the pan along with the shrimp and the chopped garlic. Sprinkle the shrimp well with the seafood seasoning. Cook a minute or two on each side until opaque. Add in 1/2 cup corn juice or water and juice of 1/2 lemon, a good pinch of salt and simmer for just a few minutes to deglaze the pan and until most of the liquid evaporate. Toss well with the sausage. Remove from heat, add in the potatoes. Warm the tortillas quickly over the gas flame. 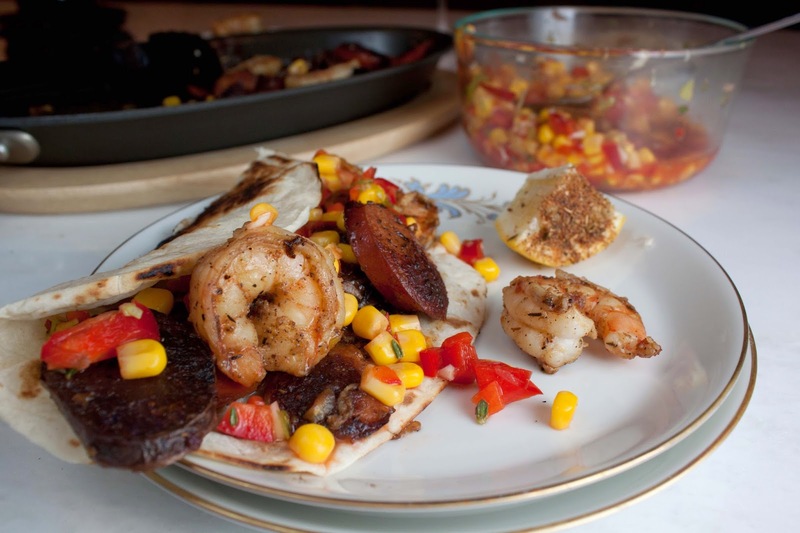 Serve with warm tortillas, a lemon wedge dredged in creole seasoning and the relish.